SanDisk has launched a new set of microSD card and guess what? it’s the highest-capacity microSD card that has ever been released. The 400GB Sandisk Ultra microSDXC UHS-I card is offering 144GB more storage than any other microSD card available right now on the market. The external storage with microSD cards has always supported us by giving extra storage space that we needed so badly. If we talk about microSD cards, then SanDisk dominates the section. The previous year we have seen Sandisk launched a 256GB microSD card which goes by the name Extreme microSDXC UHS-I. The card promises to deliver the transfer speed of up to 100Mbps which is good to save some time transferring large files. 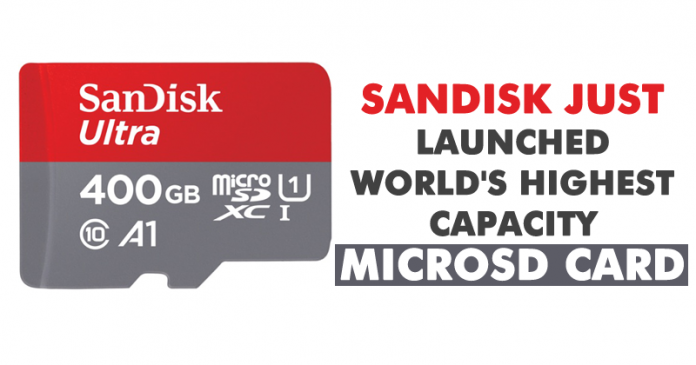 Now SanDisk has launched a new set of microSD card and guess what? it’s the highest-capacity microSD card that has ever been released. The company had unveiled the SanDisk Ultra microSDXC UHS-I card on Thursday morning at the IFA 2017 conference. The 400GB Sandisk Ultra microSDXC UHS-I card is offering 144GB more storage than any other microSD card available right now on the market. The new card also features 100Mbps read speed, A1 app performance and UHS Speed Class 1 for the best performance. By focusing on achieving new technology milestones, we enable consumers to keep up with their mobile-centric lifestyles with storage solutions they trust. With lots of offerings, we can imagine that the new microSD card is not going to be cheap. The new card is available at the retail price of $249.99 which is $50 more from the 256gb model.